Based on her memoir, Travelling to Infinity: My Life with Stephen Hawking, the focus is on the relationship between Stephen and Jane, both the remarkable ups and notable downs. Those of you looking for more science will be disappointed, but that’s not really the point here. At it’s core, Theory is a romance. You follow the young lovers from their nerdy, awkward meet cute at Oxford in 1963, through their courtship, Stephen’s diagnosis with motor neuron disease, his most groundbreaking work, and through the course of their years together. Given Stephen’s affliction, not to mention his legendary intellect, this is not your average, everyday love story, and the obstacles they face are far beyond what most people encounter. But while that’s the case, this is still a biopic, and as such, suffers from many of the afflictions that affect this kind of film. Trying to encapsulate an entire life, let alone multiple lives, in a truncated, two-hour window, there is a lot of ground to cover, and things are going to get glossed over. People show up, play an important part for a moment, and are never heard from again. The biggest example of this is Brian (Harry Lloyd), Stephen’s classmate and best friend at Oxford. The moment Stephen tells Brian about his diagnosis—a quiet, “hey, I have two years to live”—is the first real gut punch of the movie. Though Brian does figure into the story in the earlier years, as Stephen and Jane age, he falls by the wayside, only showing up as a face in the crowd in the obligatory moment of triumph near the end. The Theory of Everything never sugar coats the reality; Stephen is brilliant, but can be cold, oblivious, and often times downright cruel. And while Jane, deeply religious and artistic, provides a balance to the scientific mind of her husband, she’s human, and though she bears an incredible weight, is subject to the same faults and frailties as everyone else. The way the two strike an accord, and incorporate and accept the concrete facts of their lives, is what truly makes their story stand out from the crowd. 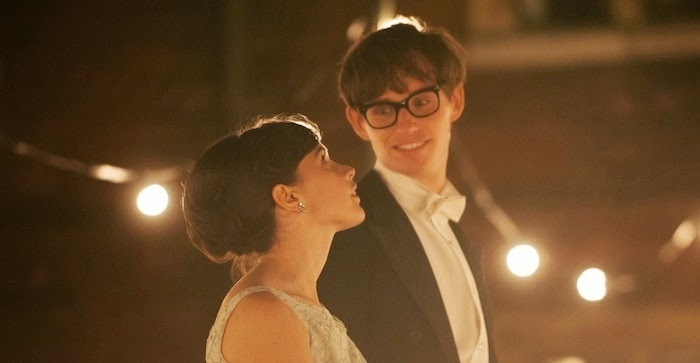 There are remarkable moments in The Theory of Everything, moments of subtle power and emotion, where you find yourself tearing up, especially as Stephen’s condition continues to deteriorate. Yet, there are many more where you skip from event to event, like an extended montage. Things happen and you accept them because that’s how they played out in real life, but this structure gives the overall pace a herky jerky, start and stop feel. For all the you’ve-seen-this-before narrative, and a story that, even with a few unique points, you can predict, it’s hard to find fault with the performances, at least outside of a few missteps in the make up department when it comes to aging Jones. Both are phenomenal. 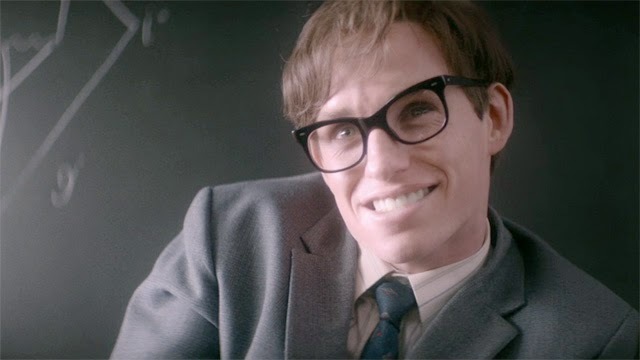 Redmayne, is getting the bulk of the praise, and for good reason. To take on a role that requires this level of physicality, yet still be able to convey an astonishing array of emotion, thought, and communication is impressive. Later in Stephen’s life, there are times when he is essentially frozen in place, but you still know exactly what he thinks and feels from nothing more than his eyes. And Jones, for her part, gives much less showy performance, though it is no less nuanced and commanding. She says very little that explicitly conveys her internal emotions, suffering in silence as she does throughout, but you’re never at a loss for what’s going on inside. While it would be easy to let a performance like Redmayne’s overshadow you, she never does, and taken together, this is like watching a master’s class in nonverbal acting. The supporting players are fine, but aside from Lloyd and Charlie Cox (Boardwalk Empire), none of them have much of any substance to sink their teeth into. Though the Theory of Everything can, at times, be little more than a by the numbers biography, with all of the highs and lows that entails, it’s worth checking out for the two leads alone. Those of you interested in a different perspective on one of the most brilliant minds of our time will also find much to enjoy. Marsh does his best to infuse the picture with a hazy, dreamy quality, and it is a lovely movie to look at, but despite that, it struggles throughout with the constraints of what it is, and never truly transcends those bonds. While it likely won’t win any best picture awards, this should add some nice hardware to both Jones and Redmayne’s statue collections, and for an intimate portrait of an unusual, intriguing couple, that’s more than enough.